Montgomery, AL – A Pulitzer Prizes Centennial Campfires Initiative, “Carried Home” is produced by the Alabama Humanities Foundation , Alabama Writers’ Forum, and Troy Public Radio (WTSU, 89.9 FM in Montgomery and Troy; WRWA 88.7 in Dothan and the Wiregrass; WTJB 91.7 in Columbus and Phenix City) in five short radio documentaries. The first broadcast on Troy Public Radio will be December 26th - 30th from Noon to 12:30. Other airings are scheduled for January 2017. Five thirty-minute radio programs highlight fifteen Alabama writers who have either won or been recognized as finalists for the Pulitzer Prize, which turned 100 in 2016. Their excerpted works and commentary sheds light on contemporary events. The five-part series is hosted by Don Noble, host of Bookmark on Alabama Public Television. “It is an interesting time to consider the best journalistic and creative writing from Alabama – by Pulitzer standards,” said Kyle Gassiott, supervising producer of the series. “Writers help us make sense of our world by recasting events and points of view for us to consider,” he said. “The journalists and creative writers featured in ‘Carried Home’ have addressed many issues that citizens in the United States are still talking about today – such as race relations, questions of immigration, the role of the press, and equitable taxation. “Although our program started out investigating the prize’s impacted on a writer’s life, it moved to more broad-ranging discussions in development. Although it was not intended to be a comment on current events per se, the writers and their subjects may help people see some issues in a new light,” Gassiott said. 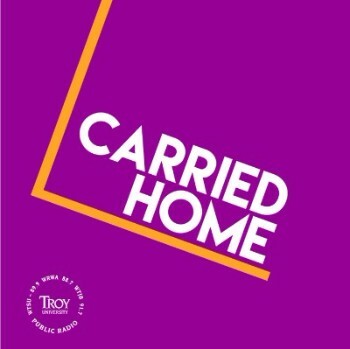 “Carried Home” is part of a major national initiative in conjunction with the Pulitzer Prizes Board, the National Endowment for the Humanities, and the Alabama Humanities Foundation The public radio programs include segments of interviews, reported pieces, and excerpted works. According to Jeanie Thompson, executive director of the Alabama Writers’ Forum, and co-producer of the series, the five programs sample brief interviews, reported pieces and excerpts of work that paint a picture of how Alabamians and Southerners think about themselves and their world. “From Harper Lee talking about small town life shortly after publication of To Kill a Mocking Bird to an excerpt from “Grady’s Gift,” Howell Raines’ memoir of growing up in segregated Birmingham, listeners will find food for thought, “ Thompson said. Some of the themes the series explores include: black and white relations, the 21st century issue of immigration, poverty, taxes, and the inevitable reporting about place – primarily rural or small town. The creative writers awarded Pulitzers in fiction, poetry, and song-writing explore these topics through the hearts and mind of characters set in easily identifiable fictional towns. In lyrical works, the speakers focus on the pain of racial injunctive or just plain human heartbreak in long-remembered lyrics that people everywhere identify with Alabama. Other non-fiction writers have addressed more objective matters such as what it means to live and thrive within different economic systems in Alabama, the South, and ultimately the world. Writers featured include: Brett Blackledge, Rick Bragg, Hazel Brannon Smith, Shirley Ann Grau, Rheta Grimsley-Johnson, Winston Groom, Hank Klibanoff, Joey Kennedy, Harper Lee (archival), Diane McWhorter, T.S. Stribling, Howell Raines, Natasha Trethewey, Cynthia Tucker, and E. O. Wilson. Sponsorship: “Carried Home: Alabama Writers and the Pulitzer Prize” is part of the Pulitzer Prizes Centennial Campfires Initiative, a joint venture of the Pulitzer Prizes Board and the Federation of State Humanities Councils. “Carried Home” made possible through a grant from the Alabama Humanities Foundation. Additional funding was provided by the Andrew W. Mellon Foundation, the Ford, Foundation, Carnegie Corporation of New York, the John S. and James L. Knight Foundation, and Columbia University.